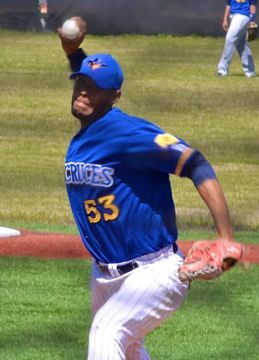 HOUSTON � The opening game of the Pecos Spring League was a pitcher�s duel between Edison Alvarez � who got the 5-0 win for the Vaqueros � and Sea Lion Brian Hicks, who got the loss despite striking out 10 in four full innings. Not surprisingly with teams that just got to know each other that morning, most of the runs came off fielding mistakes, but the Vaqueros also used heads-up base-running to manufacture runs. The Sea Lions had runners at the corners in the first but couldn�t convert, then the Vaqueros went up 2-0 in the bottom of the stanza when Dylan Stone reached on an error, stole second and third, then came home on a single by Cody Langham. In between, Carl Johnson walked and stole second and came home on a wild pitch. Las Cruces took advantage of another Galvaston miscue in the third, scoring one run when Travis Fuquay singled, stole second and third then came home on an error. 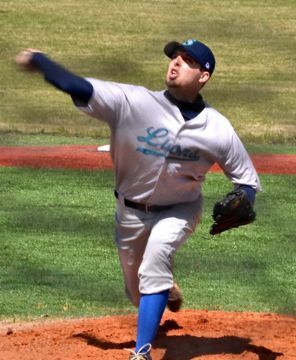 The Lions squandered a bases loaded situation in the fourth when Edgar Quintana and Justin Boning singled � Quintana reached when his ball fell between three converging outfielders then Boning beat out the throw � and Jabri Johnson reached on catcher�s interference. But Brandon Brown � who came in in relief and gave up the three base runners � bore down, striking out the next two batters and forcing the final batter to ground out. 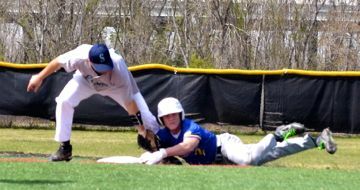 Brown kept Galveston scoreless in the fifth, then Austin Carden and Thomas Nelson did the same in the sixth and seventh. Fuquay beat out a bunt off Josh Cruse in the fifth then stole his way home to score the Vaquero�s fourth run, and, after Cruse left with an injury after two walks in the sixth, Jacob Alastra walked off reliever Bryce Miller, then came home on a fielder�s choice and double play, scoring before the third out. Stone led at the plate, going 2-for-3 for Las Cruces with two runs scored and an RBI. 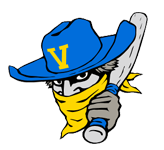 The Vaqueros will face the Garden of Gears Thursday at 1 p.m. at Coastal Ballpark, with Galveston taking on the Houston Apollos at 7 p.m. at Cristy Field. 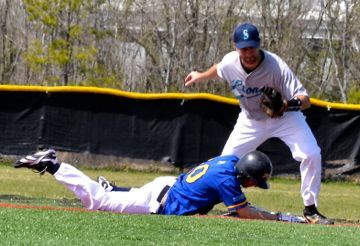 Robert Diperio tries for the tag on Dylan Stone. Edison Alvarez got the win for the Vaqueros in the opening game. Frank Florio makes the throw from left. Brian Hicks threw seven innings for Galveston. Jacob Alastra slides in safe ahead of Robert Diperio.